To me days with temps in the 70’s are absolutely perfect! There’s a wonderful breeze sending fresh air throughout the house and I love it! Thank you, Lord. 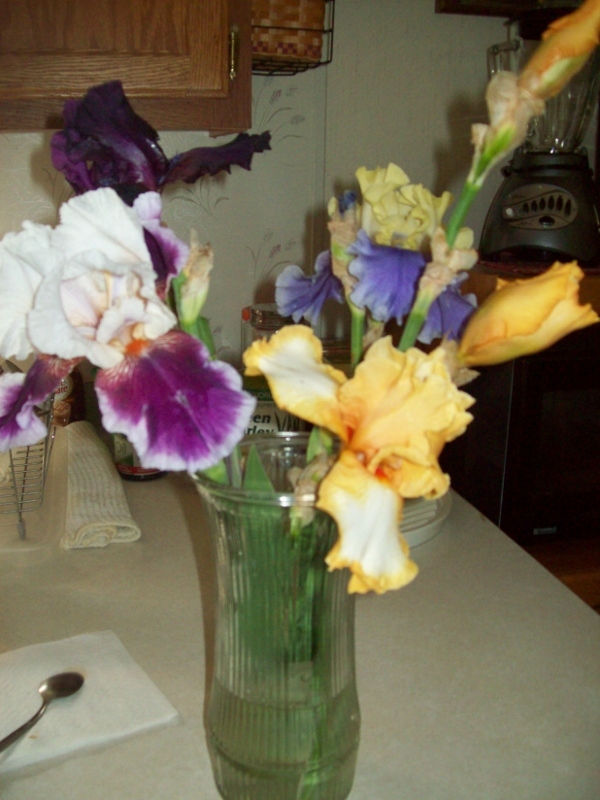 I am saddened though – my giant bearded irises are pretty much at the end of the season. I went out this morning and have only four stalk still blooming – Edith Wolford (yellow/blue), Ringo (white/reddish purple); Hello Darkness (deep purple); and one I don’t know (orange/orange and white). I stared at them quite a while trying to decide if I should leave them or bring them in for my table. The table won! 🙂 Now I can enjoy them all day long! !